EKS driver Mattias Ekstrom tops the standings after winning the season’s first three rounds [Barcelona, Montalegre and Hockenheim]. Joining the 18 permanent drivers on the World RX grid will be six additional entries including Belgian hero Francois Duval. The former WRC driver will pilot an Albatec Racing Peugeot 208 Supercar at his home event. “I am very happy to drive for Albatec Racing at my home event. Albatec is a serious team,” explained 36-year-old Duval. “We will race effectively the same car as Sebastien Loeb, which is great. I have seen the Albatec car in competition and I am very confident that the work they have undertaken over the winter will put us in a strong position to challenge for a good result. It will be the first time ever that I drive a Peugeot, so it's again something new for me. I can't wait to race at Mettet!" Former FIA European Rallycross Super1600 and TouringCar Champion Michael De Keersmaecker (MDK) will also race in his home event on top of his Euro RX Supercar commitments. The DA Racing team will field its second Peugeot 208 WRX for former WTCC racer Gergoire Demoustier, the driver taking part in his third World RX event following appearances in Barcelona and Portugal. France’s Guerlain Chicherit will continue his year of development and learning by racing a Renault Clio Supercar in the event, in preparation for competing full-time in World RX 2018 with a brand new Renault Megane Supercar. Poland’s Martin Kaczmarski will make the third World RX start of his career, and Hungary’s Tamas Karai will race at the circuit where he scored a Euro RX podium finish in 2015. The list of RX2 entries is headed by reigning champion Cyril Raymond, who will defend his title driving for the Olsbergs MSE team. The French driver will be joined in the squad by America’s Tanner Whitten, who will make his debut in the series at Mettet. Reigning British Rallycross Champion Dan Rooke graduates to RX2 in 2017, having made his inaugural appearance in the category at Lydden Hill last year. Two brother and sister pairings will compete in the series: Andreas and Jessica Backman plus Simon Olofsson and his sister Sandra Hultgren. The first Kenyan driver to start in a World RX event, Tejas Hirani, will also return, while Latvia’s Vasiliy Gryazin is set to be a permanent fixture in the RX2 line-up, following his debut in the class at his home event in Riga last October. The former rally driver will be joined by a pair of experienced home rally competitors at the opening round in Belgium. Ghislain de Mevius will make his RX2 debut at Mettet, as will Guillaume De Ridder, driving for the JC Race Teknik team. Also in the JC Race Teknik squad will be Norway’s Sondre Evjen and Sweden’s William Nilsson, the pair finishing fresh from placing second and fourth in the RallyX Nordic season opener. Norway’s Thomas Holmen was fifth in his home RallyX Nordic event in an STS RX-run car and will begin his RX2 title challenge in Belgium, where former Euro RX Super1600 racer Glenn Haug will make his switch to four-wheel drive in RX2. Norway’s Simon Wago Syversen will return with the Set Promotion team, while Sweden’s Anders Michalak and Santosh Berggren will get their seasons underway in Belgium, Berggren driving the car that Kevin Hansen used to win the title in 2015. RX2 joins World RX at seven events in 2017, with the champion set to be crowned at the season finale in Cape Town, South Africa, in November. The FIA European Rallycross Championship for Super1600 and the FIA European Rallycross Championship for TouringCar will both feature at the Mettet event. Ulrik Linnemann won the first round of the Super1600 Championship in Portugal and leads the maximum 30-car field. Belgium’s Davy Van Den Branden will race a Citroen DS3 and Nick Vanalken will contest his home event in a Volkswagen Polo. In the 15-car TouringCar field, Barcelona winner Philip Gehrman leads the Championship going into Belgium. Belgium’s Steve Volders will be joined by compatriots Danny De Beuckelaer and Florent Hontoir. Find the full entry list for World RX here. The Euro RX entry list can be viewed here. 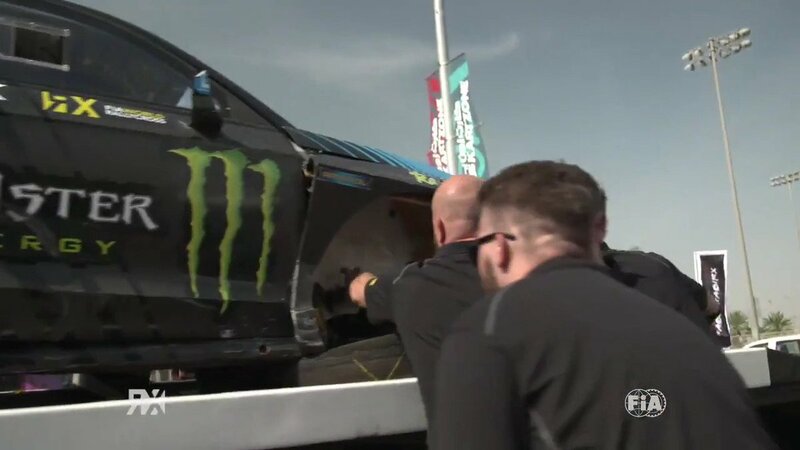 For the past three seasons, World RX drivers have been vying for the infamous Monster Energy Super Charge Award based on securing the race lead into turn one of the final. For 2017, however, the World Championship’s presenting sponsor is turning up the tension again by making the award all about reaction time – to win this year’s coveted award, it’ll be a case of fastest reaction to the lights.